The literary character of Nancy Drew, created by the Stratemeyer publishing syndicate in the 1930s, has endured for more than eighty years. Successfully solving complicated mysteries, Nancy Drew offered girls the role model of a confident, independent young woman, functioning simultaneously within what was considered appropriate within the sphere of her gender and outside of that sphere in terms of her so-called moxie. 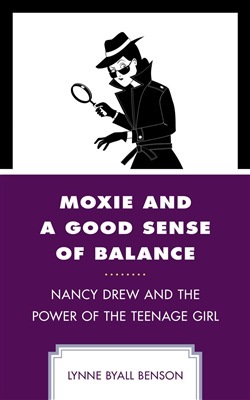 Nancy Drew’s portrayal in the books has changed over the years, reflecting changing social norms, becoming a more obedient and less independent in the 1940s as women returned to traditional roles after World War II. Surprisingly, the Nancy Drew of the 1970s and 1980s did not reflect the changes brought about by the women’s movement and instead was transformed into a glamorous, globe-trotting professional private investigator in The Nancy Drew Files. The publishers soon came to their senses and brought back the plucky Nancy of old. In addition to analyzing Nancy Drew as a proto-feminist role model, Lynne Byall Benson provides a comprehensive bibliography of sources that can be used by scholars and teachers. Acquista Moxie and a Good Sense of Balance in Epub: dopo aver letto l’ebook Moxie and a Good Sense of Balance di Lynne Byall Benson ti invitiamo a lasciarci una Recensione qui sotto: sarà utile agli utenti che non abbiano ancora letto questo libro e che vogliano avere delle opinioni altrui. L’opinione su di un libro è molto soggettiva e per questo leggere eventuali recensioni negative non ci dovrà frenare dall’acquisto, anzi dovrà spingerci ad acquistare il libro in fretta per poter dire la nostra ed eventualmente smentire quanto commentato da altri, contribuendo ad arricchire più possibile i commenti e dare sempre più spunti di confronto al pubblico online.